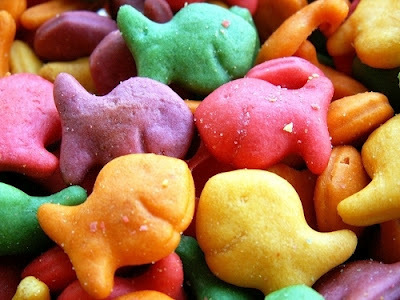 I will never forget the time I got the dirtiest look from a mom at preschool when I gave Joe his snack and it was a baggie of the new-on-the-market multi-colored Pepperidge Farm goldfish crackers. I guess it was the lurid prospect of purple and red food dyes near her child and in my child’s stomach that caused her alarm. It’s been awhile since I’ve struggled with a toddler over food in the grocery store. Joe is 10 now and I don’t take him to the store with me unless I have to! 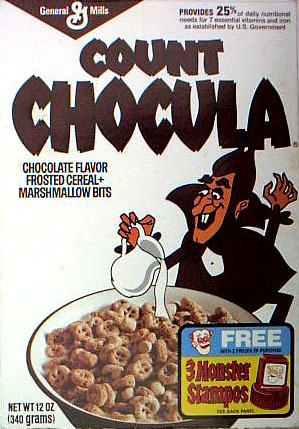 But I painfully remember cursing those evil geniuses in food marketing behind the obvious placement ploys in the cereal and snack aisles. STOP! MOMMY! THERE ARE TOYS INSIDE! Fruit Loops and Shrek candy placed right at child-in-cart eye level. Those end caps of potato chips – brightly colored, exploding with exciting graphics. And the dreaded chocolate-infused, Skittles, Lifesavers, and M&M-fest that is the check-out lane. When Joe was riding in my cart, I sped by the cereal aisle like a Mom at Nascar. It was just too much. Joe would be pointedly shouting out that he “LOVES Fruities, Mommy” as we passed the Fruit Loops at exactly kid-eye level. And there was just no time to try to comparison shop, looking for the box with the “1/3 less sugar than regular Fruit Loops” or to discern if Cocoa Puffs were really made with whole grain as they claimed and if so, so what? Meanwhile your toddler is beside himself with the choices and the prospect of something yummy that he’s never had before and the harried mom is trying to do the math to see if the sugar content calculated by the actual serving size is really below 9 percent of the total….sheesh! Maybe all moms should take a class on reading nutrition labels at birthing class. Help me! I have to do math in my head to figure this out and I have a toddler AND a new baby. I need food and sleep. Not nutrition labels. I also remember a battle between my husband and I over Trader Joe veggie fries, otherwise known in our household as “kiddie crack.” I thought this was acceptable food, after all they do have vegetable matter in them and lots of air. However, my husband considered them junk food, and given my son’s unnatural appetite for stuffing his face with these until he explodes, I think my husband was right. 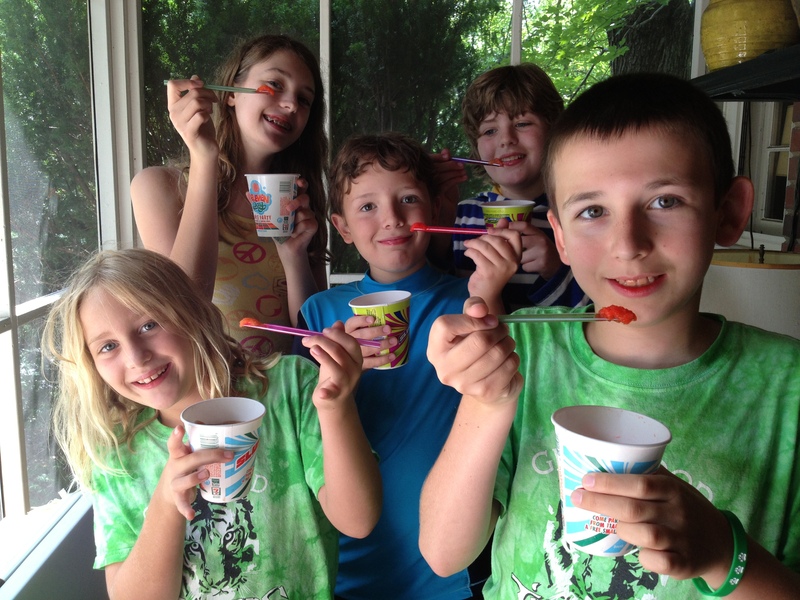 Making good food choices and clashing swords over the junk food battlefield with my budding middle-schooler still happens and I do try to make sure Joe gets in his four food groups (wait, aren’t there 5 now?) over the course of the day. And what, veggie crack fries are not in one of those food groups? No worries. Joe doesn’t break my back for those anymore now that he’s moved on to the barbecue potato chips that the babysitter turned him on to. 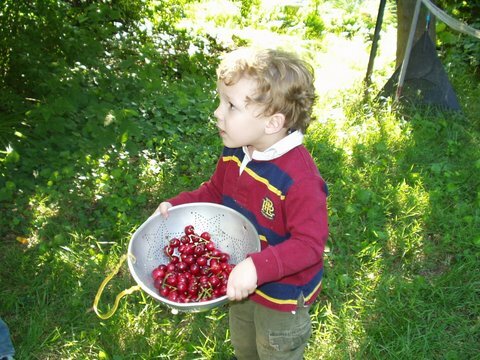 Joe with cherries from our neighbor’s tree. Love that pic of Joe! I remember that rugby shirt, right?? Anyway, as you know I have two of the biggest eaters around at my house and I’ve managed to get the big one to eat grilled beets and brussels sprouts, and the little one is eating soft boiled eggs on quinoa. I know I’m bragging, but we have come a long way from a 28 piece serving of pot stickers! Maybe my child and husband will no longer be relegated to the Glutton’s Circle of Hell! I got capped on by a mom last year when she saw me hand my kiddo one of those squeezy applesauce tubes. I think it was more that she objected to wasteful packaging than the contents, but whatever. I can’t stand judgy parents! Becky, your posts are fun to read! I hope you are also tweeting them. You’ll get more bang for the social-media buck if you, say, post to the blog on a Monday, feed it to Facebook on Weds., and tweet it on Friday. S-t-r-e-e-e-e–t-c-h ’em out!